Alfred, 871 - 899; King of the Anglo-Saxons; England's greatest ruler-the only one to earn and deserve the epithet, The Great. Military Strategist; Leader, with profound gallantry, personally and repeatedly engaged in the van of armed combat; Founder of the defensive shield, the Royal Navy; Conqueror of the Danish and Scandinavian Invasions; Peacemaker and Statesman; elected Monarch who united England, instituted the Witan (administrative council); reaffirmed the Sovereignty of the Juror in deciding the law (viz. Unanimity); id est, government of Constitutional Legem Terræ Common Law Trial by Jury (cf. demos-kratein; demokratia, the people rule through Trial by Jury; the Hellenic Athenian Constitution of government by Trial by Jury); reaffirmed the judicial role of the Jurors in Trial by Jury, with convenors (nowadays misnamed 'judges') returned to their traditional correct functions, having no judicial role but merely court administration, security duties and subordinate to the principal official at Trial by Jury, i.e., the Jury's elected Foreman (or today, woman); the originator and instigator of the culture of universal literacy; personally translated several literary works from Latin, including Boethius' "The Consolation of Philosophy." 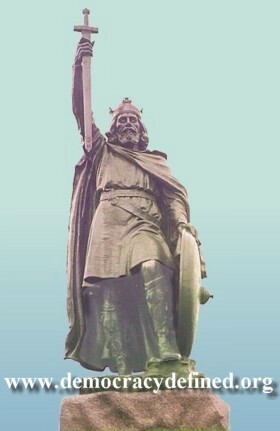 Statue of King Alfred at the historic Capital of the Kingdom of Wessex, Winchester, in Hampshire, England. King Alfred had Justice (judge) Cadwine hanged because Cadwine had a man named Hackwy put to death by hanging, without the unanimity of the jury of twelve men. In this case, three jurors pronounced the Not Guilty verdict against nine. Cadwine removed the three and selected three others who would also pronounce 'guilt'. Similarly, King Alfred had Justice Frebern hanged, because Frebern hanged a man called Harpin, when the jurors were still in doubt as to their verdict. Alfred established that when there is a doubt, it is in the interests of all people that justice should save rather than condemn. See "The Mirror of Justices," compiled and published by Andrew Horne in Old French. The Mirror was written within a century after Magna Carta. It contains an account of Alfred's acts and judgements, thought to have been originally composed by him. Also see Chapter Six, Vol. 2, 'Works,' by Justice James Wilson, co-author of the U.S. Constitution. The British Constitution Group campaigns for the restoration of Britain's ancient constitution, which, for several decades has been systematically denied and undermined by successive governments of all political parties. The BCG is non-political and does not endorse or support any political party. Becoming a member of the British Constitution Group is a declaration of your agreement with our desire to see the people of this nation reclaim their sovereignty. Join us and add your voice to our desire to see our constitutional principles reasserted. French lawyer and Human Rights Campaigner - Member of The Democracy Defined Campaign. Experienced Counsellor-at-law ("Conseil Juridique"). Lecturer at Paris University (High Studies for Legal Counsellors). Available as a "Cyber-lawyer" to businesses and individuals in international and domestic law, working in French and English from his virtual office. A Campaigner for Restoration of Trial by Jury. The Freedom Association was founded by Major John Gouriet, the Viscount de L'Isle, VC, KG, PC; Ross McWhirter and Norris McWhirter, CBE. The Ragged Trousered Philosopher. Harry Stottle. Highly recommended; a very readable philosophy contained in a Web book; and important articles including the Police State of America (see Side Issues). The British Weights and Measures Association. JOHN GARDNER, U.K. National Director of The British Weights and Measures Association, is an endorsee of KENN D'OUDNEY's "Treatise on Law, Constitutions and Democracy, WHY THE D'ESTAING CONSTITUTION IS THE ANTITHESIS OF DEMOCRACY" ISBN 1902848748.